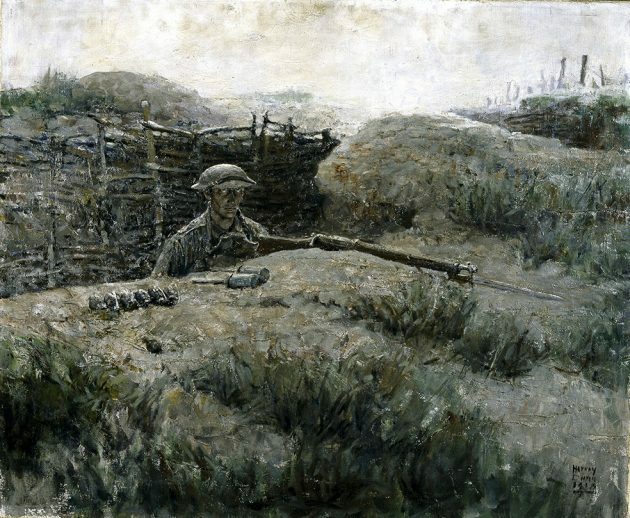 Rough, thick oil pigments layered upon the surface of Harvey Dunn’s 1918 painting “The Sentry” amplify the jagged fatigue in the eyes of a solitary WWI soldier staring out from the canvas. Rifle and grenades close at hand, chest deep in a trench, the intensity of this American’s gaze is haunting. Dunn was one of eight professional illustrators commissioned as officers in the U.S. Army during WWI to embed with the American Expeditionary Forces in France and document the activities of American soldiers. “Artist Soldiers,” on display on the second-floor art gallery of the National Air and Space Museum, contains 54 of some 700 sketches and paintings completed by these artists that capture a broad and compelling “in-the-moment” portrait of WWI. Also on view in the Air and Space Museum’s art gallery are 29 images by private photographer Jeff Gusky of stone carvings made by soldiers in underground stone quarries in France where troops took shelter during WWI. With hammers and chisels, soldiers carved portraits, patriotic symbols, messages of longing for loved ones, humor, expressions of religious faith, and even elaborate chapels. Gusky, working closely with local French landowners, reveals this fascinating underground world for the first time. “Artists Soldiers,” also contains numerous examples of trench art: objects that soldiers made from artillery shells, bullets and other military equipment, which further document the creative expression of the participants of the war. 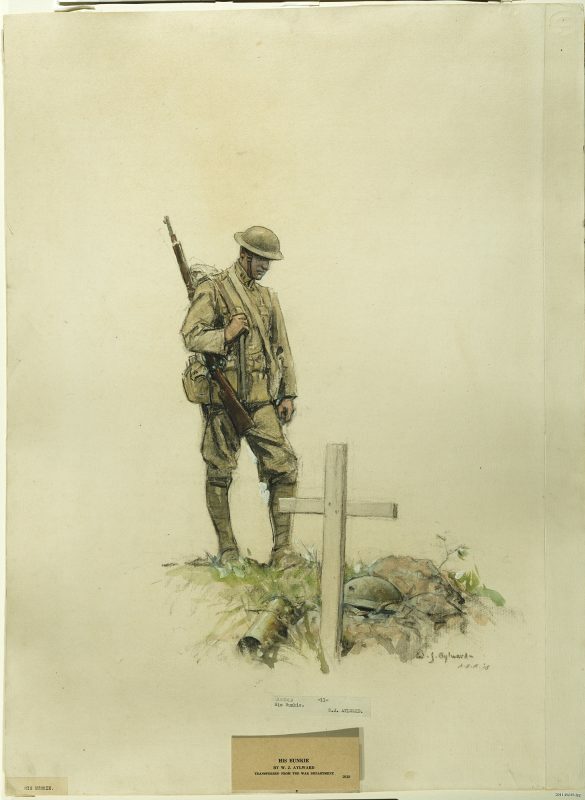 The April 6 opening of this collaborative exhibition with the Smithsonian’s National Museum of American History, which holds the commissioned sketches and paintings in its collection, marked the 100th anniversary of America’s entry into WWI. 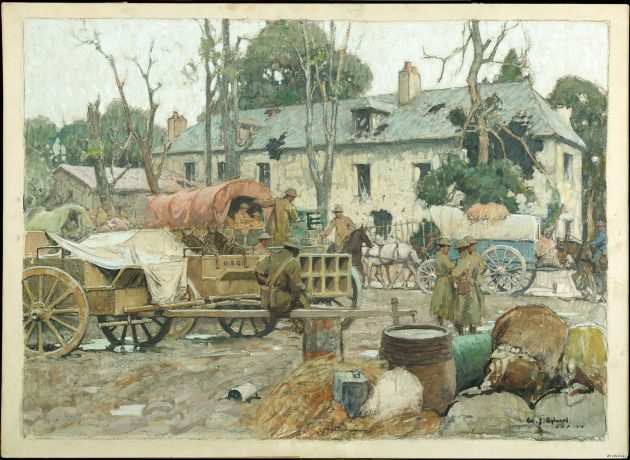 Other American Expeditionary Forces (AEF) artists whose works appear in the show are William James Aylward (1875–1956), Walter Jack Duncan (1881–1941), George Matthews Harding (1882–1959), Wallace Morgan (1873–1948), Ernest Clifford Peixotto (1869–1940), J. André Smith (1880–1950) and Harry Everett Townsend (1879–1941). 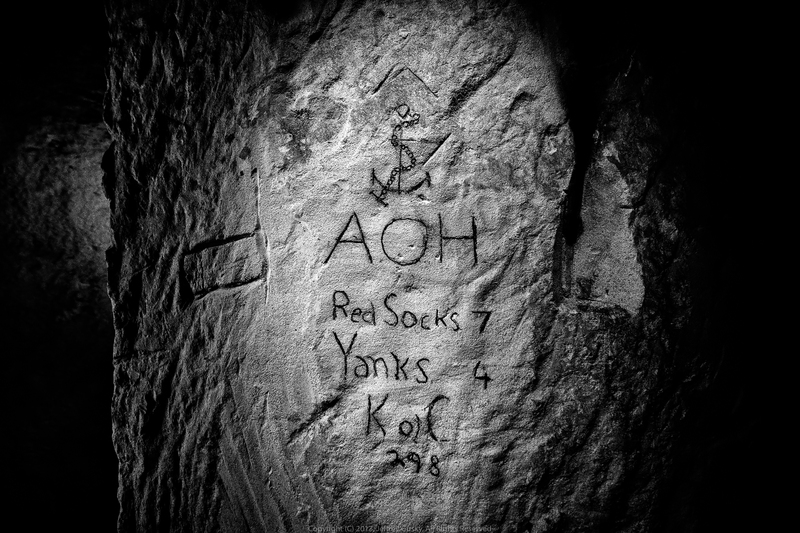 All AEF artists were made captains in the Army Corps of Engineers and given a great deal of freedom to move about during the war. Their artworks were intended to be shown back in the United States to influence American attitudes about the war. 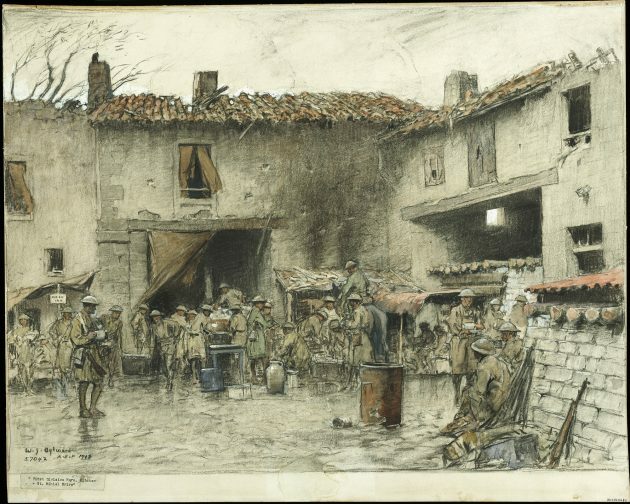 “They were renown illustrators and advertising artists—one or two of them came out of the Pennsylvania Academy of Fine Arts—selected for their artistic skills, put into military uniform and then placed in different areas of the war, either at the front or to record the troops coming in,” explains Jennifer Jones, a military curator and Chair of the Armed Forces History Division at the American History Museum. 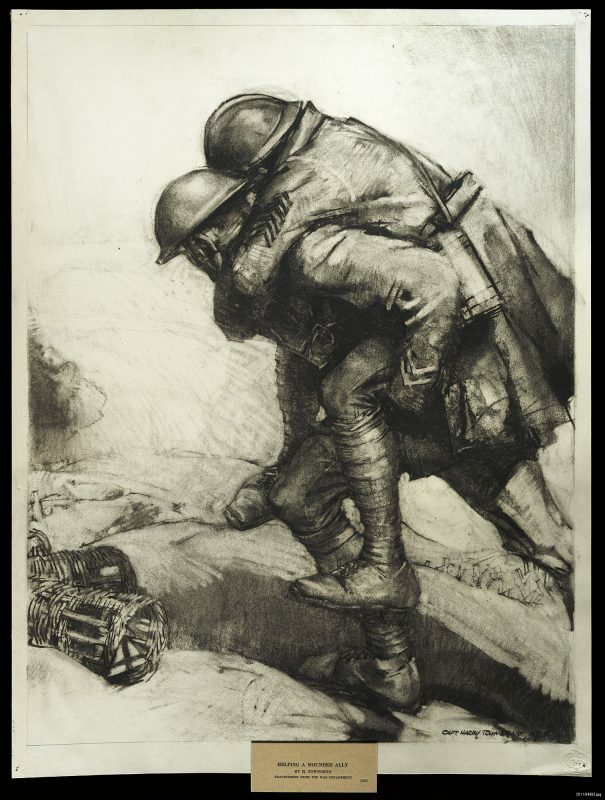 For the AEF section of “Artist Soldiers,” Jakab selected the artworks from the American History Museum’s collection, choosing works that best captured the breadth of subject matter covered by the AEF artists. A heavily used Harvey Dunn sketchbook in the exhibition reveals how the artists made rough sketches in the field and later polished and finished their works in behind-the-lines field studios or studios in Paris. Once complete, the artworks were turned over to the Army where they were officially registered, and, if deemed appropriate by censors, were sent back to the U.S. to be used in advertisements and media. An Army stamp “OK to print,” appears on the back of many of the prints. Traditionally, war art featured heroic figures and gallantry in battle. 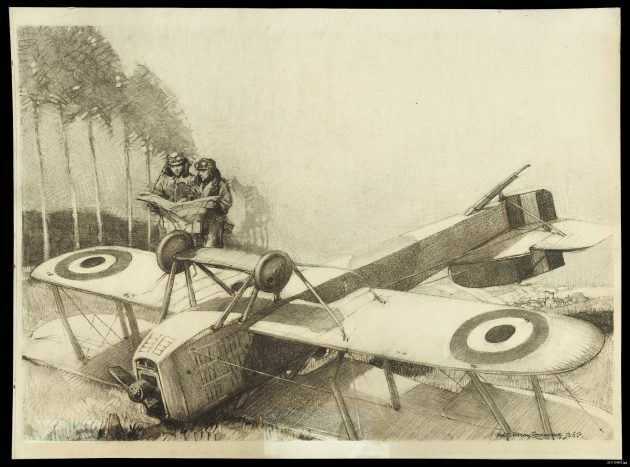 These WWI works depict a more complete and realistic view of war. While Dunn and others focused on life at the front, Walter Jack Duncan focused on troops in rear areas who were keeping the army supplied and William Aylward concentrated on the logistics of WWI, especially French ports. “When most people think of the military they think everybody’s in combat,” Jones says. “Well, in modern war about 80 percent of soldiers are logistics and support and only 20 percent are the tip doing the fighting.” But this war affected everyone in villages, towns and cities and displaced millions of civilians. 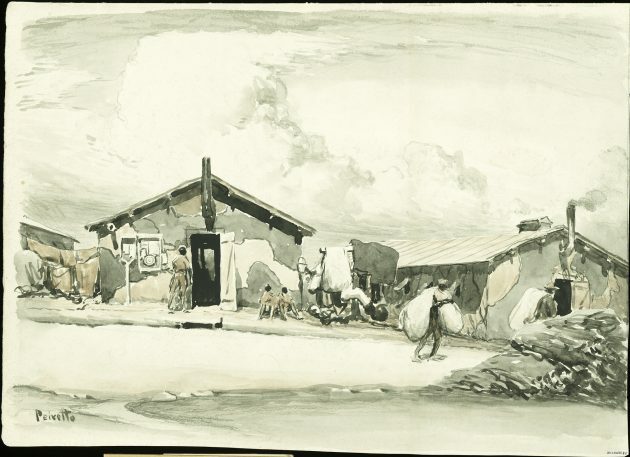 AEF artists captured a broad experience of the war—including mundane chores such as feeding the troops, interactions with displaced villagers and caring for the wounded. Sections of the exhibition such as “Engineers go to War” and “The Human Cost” depict WWI away from the battlefront. 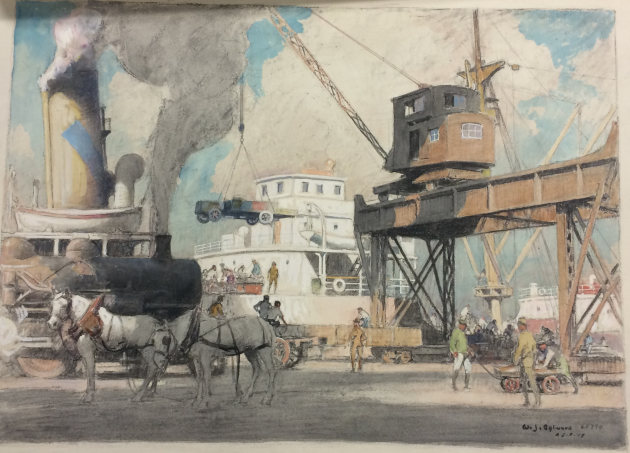 Walter Jack Duncan’s 1918 pen-and-ink wash sketch “Newly Arrived Troops Debarking at Brest,” is an eye-opening look at just how many U.S. troops were crowded aboard a military transport ship. Even though the soldiers appear swarming the steam-ship’s deck and must have been desperate to get off, they disembark in an orderly manner. “It’s in the sketches of the support areas, such as the docks and the hospitals, where more diversity—African American soldiers and women—are depicted,” Jones points out. Another gripping artwork on display is the sketch “His Bunkie,” by Aylward. It shows a soldier who has just buried a close comrade. He stands near an artillery shell and helmet on the ground, gazing numbly at an upright white cross. “You can see how the soldier is lost and the way he is looking sorrowfully at his fallen comrade, but he has to go on,” Jones observes. A second oil by Dunn in the exhibition titled “On The Wire,” is a remarkably powerful yet subtle depiction of the brutality of war. 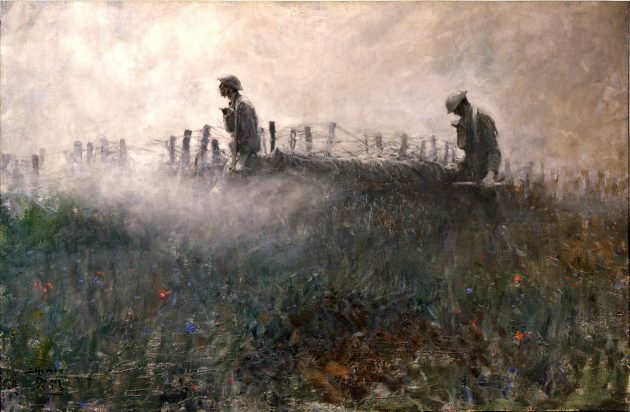 In it two exhausted soldiers carry a third on a stretcher along a rise crowned with a barbed-wire barrier shrouded in smoke. Blue and red flowers dot the hillside and the sun is rising as the two soldiers, bogged down by the litter, move through the devastation surrounding them.